Naples was an independent kingdom again for the first time in two hundred years. After twenty-five years of rule, Charles would abdicate and return to Spain. They say that before he left he was careful to return the crown jewels. He even gave back a ring which he, himself, had found while digging around Pompeii, saying, "Even this ring belongs to the state". This story, true or not, shows the regard, even veneration, that has attached itself to this first Bourbon king of Naples. He was paradoxically sad yet energetic, outgoing but melancholy, and he is almost unanimously regarded as an example of the "enlightened monarch". Charles left impressive accomplishments: he restored some order to public finance, curtailed church privilege, and built many now familiar, spectacular architectural features, such as the royal palaces at Capodimonte, Portici and Caserta. He also started the National Library, the Archaeological Museum, a National Academy of Art and the excavations at Pompeii and Herculaneum. By the middle of the century, Naples was a capital of Enlightenment Europe, and Antonio Genovesi, lecturing at the University, could freely speak of redistribution of property and agrarian reform. Also, Naples developed into a music capital of Europe, much of it performed in the most splendid theater of its day, San Carlo. Most of all, perhaps, Charles encouraged the growth of a new commercial middle-class and sought to move his subjects out of the lingering middle ages of anachronistic class privilege and baronial abuse. Well-meaning or not, however, he was not entirely successful in confronting this age-old problem, which is evidence of the powerful inertia of centuries of feudalism and of the overwhelming forces of reaction arrayed against him. In 1759 Charles returned to Spain to succeed his father on the Spanish throne. He left Naples in the hands of his eight-year old son and a regent. His son Ferdinand ruled until 1825. It was to be a dynamic period: the Industrial Revolution, the social and political theories of Rousseau and the music of Ludwig van Beethoven. Primarily, it was the French Revolution, Napoleon, and armies ranging over Europe on an unprecedented scale. If, from the late 20th century, we look back at, say, the 1750's and view as 'quaint' a scene of fat bewigged monarchs bouncing on horseback through the woods, by 1825 the scene would change: a young Darwin would be wondering what made the world go round and Karl Marx would already be seven years old. It would be many things, but not 'quaint'. Back to 1759. 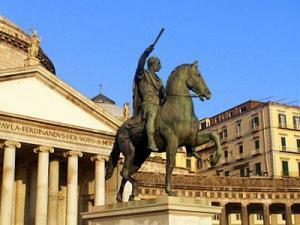 Ferdinand (the statue, left, is at Piazza Plebiscito) was uniquely unfit to run a kingdom. He was a good-natured knucklehead who spoke only the local dialect, loved to roughhouse and bandy jokes with his servants and, indeed, felt so at home among them that he was called the lazzarone king, that term (from St. Lazarus, the patron saint of lepers) being the term for any of the unwashed teeming masses. He hated to read, but was very big on the other two Rs—riding and relaxing. Fortunately, Charles III had left the Foreign Secretary in charge, one marquis Bernardo Tanucci, a capable and intelligent manager. Even after the child-king came of age in 1767, Tanucci ran the government down to the minutest detail. He was basically concerned with conserving the cultural and economic institutions that Charles had left in place, and he did as good a job as possible in the face of a baronial and ecclesiastical opposition determined to preserve its privileges. 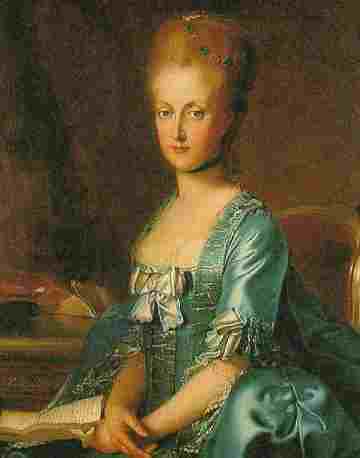 In 1768 Ferdinand married the Archduchess Maria Carolina of Austria (painting, below) the sister of the Emperor and the younger sister of Marie Antoinette. She was intelligent, headstrong and utterly convinced that she had been born to rule. She had a seat on the ruling council of Naples and set about to make Naples into what a royal court should be, another Vienna or Paris. She owned and treated the king like the fun-loving sheepdog he was and during the 1770s and 1780s made Naples into less of a marketplace of Enlightenment thought and more of a showcase of royal glitter with cultural institutions nevertheless still worthy enough to attract Mozart and Goethe. The queen forced Tanucci to resign, and she acquired the services of John Acton, an ex-patriate Englishman who had been commander of the naval forces of Tuscany. In the decade before the French Revolution, Acton remade the Neapolitan royal navy into one of the finest fleets in the Mediterranean. He opened arms and ironworks factories, built bridges and roads and founded the Royal Military Academy. By the time of the Revolution (1789), he, as much as the queen, was in charge of the Kingdom of Naples. The king was usually out hunting. When the French Revolution started, Acton and the Queen were concerned with keeping the kingdom safe from infection by revolutionary French ideas. Interestingly, the masses in Naples —those who might have stood the most to gain from storming a Bastille or two— did not seem to be interested in throwing off their yoke. Intellectuals debated the virtues of revolution and radical social reform, but the people, themselves, generally liked their king and disliked anything French, even progress. By 1793, however, the French King Louis XVI had been beheaded, the Austrians and French were at war, and battles were flaring up in northern Italy as revolutionary fervor took hold. Naples agreed with the rest of European royal opinion that the revolution had to be stemmed, and in the summer of 1793 troops from the kingdom joined the Spanish and British at the port of Toulon, recently taken by the British, to keep it from being recaptured by forces of the French Republic. They failed, and in so doing gained the dubious distinction of providing a young artillery officer from Corsica with his first victory—and a promotion from lieutenant to Brigadier General. By 1797, Napoleon had swept through northern Italy, and in 1798 the French invaded the Vatican States to set up the Roman Republic. Through their looting and violent antireligious behavior (including the imprisonment of the Pope), they alienated the Roman populace completely. Naples then sent troops to drive the French from Rome. They were unsuccessful and the French counterattacked into the kingdom. With French troops at the door and the now very real threat of Republican insurrection from within the city of Naples, the King and Queen fled to Sicily on Christmas of 1798. Naples fell after bitter fighting between Republican French troops and their Neapolitan sympathizers on one side and the ever loyal poor lazzaroni on the other, dedicated to their king right to the end. With the French victory, the Parthenopean Republic was declared. Although some have termed it a 'revolution', there is little doubt that the Republic was imposed by force from without. The French also imposed war 'reparations' on the new Republic, thus further antagonizing the people. The Republic was destined to last a mere five months. The King and Queen may have fled to Sicily, but they were not idle. King Ferdinand set about retaking his kingdom. He found Cardinal Ruffo, a warrior zealot who landed on the Calabrian mainland with nothing but a flag and his own forceful personality. 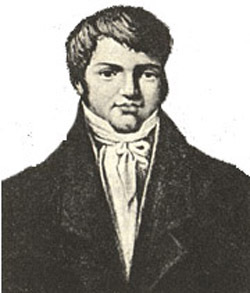 Ruffo raised an army from among the tough peasantry in the surrounding countryside as he marched north. Depending on who is telling the story, Ruffo's Christian Army of the Holy Faith, the sanfedisti, were either ruthless fanatics or they were a collection of Robin Hoods (such as the famous bandit, Fra Diavolo) loyal to their king, on a mission to drive out foreign invaders. In fairness to Ruffo, he tried to curb the excesses of his troops, and if they were violent, it is equally true that their opponents, those who were dispensing Republican libertè, fraternitè et ègalitè in the ex-kingdom of Naples at the moment, were equally passionate. Suffice it to say that there was barbarism on both sides as Ruffo swept north, up through Calabria and Puglia, into Campania and towards the capital. The tide was now turning swiftly against the French Republic in Europe. Combined forces of the monarchies in Britain, Russia and Austria were taking advantage of the absence of Napoleon. He was off in Egypt during most of 1799 attempting, and ultimately failing, to destroy British influence in the Mediterranean. During that time, virtually all of the Republic's advances in northern Italy, which he had brilliantly forged two years earlier, were reversed. For Naples, the time could not have been better for a royalist reconquest. The French pulled the main body of their army north and left a token force in the city. With British allies under Admiral Nelson blockading the port of Naples, Ruffo and his army entered the city. They offered the defenders free passage if they surrendered. They did, but Nelson, certainly at the behest of the royal family, still in Sicily, and over the strenuous objections of Ruffo, who had given his Christian word, had a number of the Republican defenders put to death, including the Republican Admiral, Caracciolo, who was hanged from the yardarm. The subsequent mass trials and executions of supporters of the Republic are infamous. Royalist Neapolitan forces had taken advantage of a general French collapse in Northern Italy and, indeed, the collapse of the French Republic, itself. For a moment in late 1799, after a decade of incredible turbulence, the monarchies of Europe saw 'the light at the end of the tunnel'. It was a brief respite, however, for Bonaparte was back in Paris and on November 9, 1799, he overthrew the French Directory and became First Consul. It was notice to the princes and kings of the continent not to get too comfortable in the imperial mantle of Charlemagne.